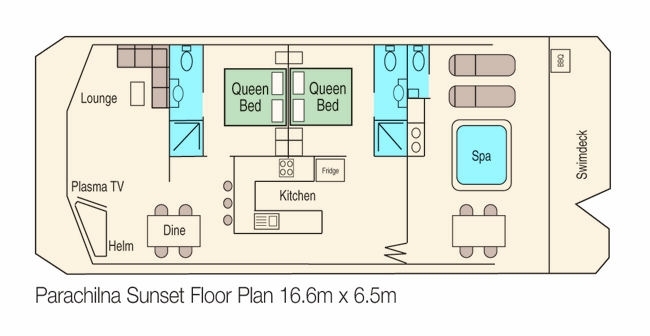 Parachilna Sunset - Conceived to provide the ultimate houseboat experience for one or two couples, this sophisticated 2-4 berth (2 Queensized Beds) houseboat offers the latest in designer finishes and a spacious yet intimate interior. 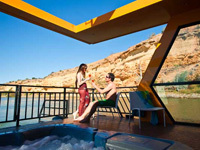 If you are planning a honeymoon, this houseboat is one of the perfect houseboats for hire. 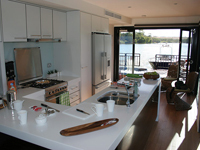 The innovative design incorporates open living from front to rear with windows to the floor and no side rails to obscure your panoramic river view. 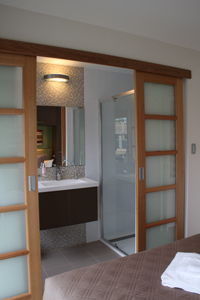 Café doors at the rear, create an indoor-outdoor flow to the spacious outdoor deck with an inset 6 person spa. Relax, fish, laze in the sun or enjoy watersports from the swim deck with inset V for towing your boat or jet ski. Powered by a whisper quiet, fully automatic, gen-set and inverter system consealed below the Teak decking and propelled by very economical, twin 90HP Honda 4 stroke outboards. Spoil yourself aboard this luxurious vessel, a bold statement in style and comfort! 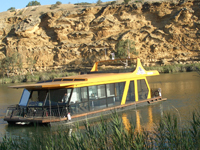 It's one of the perfect houseboats for hire from the Unforgettable fleet. 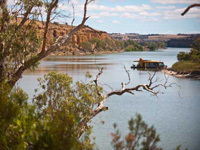 Get a feel for this unique boat by watching the video footage from Discover SA. Click on the logo at the top right of this page.